As Drupal has evolved it has become more than just a tool for building websites, it’s also become a platform on top of which complex pieces of software can be built. While many different types of software have been developed using Drupal, one kind that has been notably absent is a native Customer Relationship Management (CRM) system. 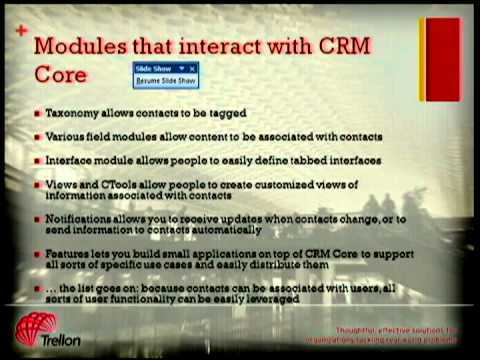 CRM systems are essential tools for many organizations and are used in very different ways. These vary from tracking sales of cars to organizing volunteer efforts for non-profit organizations. To account for the many different ways in which CRM’s can be used, most systems have a large array of features that attempt to fulfill every potential use case that a user might have. As a result most CRMs end up having a poor user experience and in some cases they are nearly impossible to use. Rather than build another overly complicated CRM, let’s leverage the power of the Drupal platform to distill down the CRM to its most basic components. Using Drupal technologies such as Search API, Rules, and Views, we can extend the basic components to build sophisticated, tailored CRM systems without bringing along a bunch of extra cruft. This presentation will cover the architecture of Drupal CRM, how it differs from other CRM software, how it can be integrated with other Drupal modules and systems, and finally it will explore how it can be extended to meet different use cases.